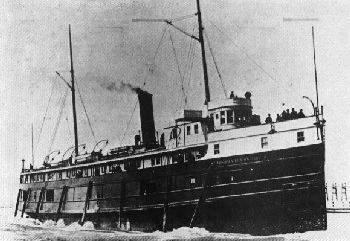 The Chicora was a stout oak hulled steamship built at Detroit in 1892 for the Graham and Morton Steamship Co. for year-around passenger and freight hauls from St. Joseph to Southern Lake Michigan ports. The ship was moored at St. Joseph during the winter of 1894-95, and apparently kept on stand-by for special trips. On Sunday, Jan. 20, the owners received a request for delivery of a shipment of late winter flour from Milwaukee. Captain Edward C. Stines of St. Joseph took the vessel with a crew of 22 other men to Milwaukee that day to pick up the cargo. With the second mate ill, Stines signed on his son, Benjamin, 23, to replace the mate. The next day the Chicora left the Milwaukee dock at 5 a.m., steaming off into quiet waters for the return trip across the lake. A messenger arrived at the dock only minutes later with a telegraph from John Graham, the ship’s owner, warning Stines not to sail because the barometer was falling fast at Benton Harbor. A storm was obviously building. The Chicora was consequently caught in the fury of a January gale on the lake before reaching port. Later in the day, the ship was reported overdue and telegrams were sent along the coast to alert harbors to keep watch. At least two eye-witnesses reported seeing a ship in trouble off South Haven that afternoon. One man said he saw the ship with its stern down and obviously sinking. Another said he heard the ship’s steam whistle blowing and knew it was a ship in trouble. After the storm abated, a crew of men from Saugatuck went out on the ice to find a line of wreckage frozen in the ice about three-quarters of a mile from shore. Wreckage was found from Saugatuck south to South Haven. Among the debris were both masts, some oars and an eight-foot piece of the deck. The masts were skidded on the ice to shore by some Douglas men. That spring they were presented to the Village of Douglas and one was used as the town flag pole. The pole stood for the next forty years before it went on display at the Allegan Museum.